Printing top quality professional labels and signs could not be any easier than with the LabelTac 6 Duo Color GHS Printer. We use the printer for creating high-visibility advertising banners that are displayed outside of our business. We love the idea that we can make our own without paying for someone else to make them. Staying ahead of the competition requires companies to draw more attention to their business. One of the easiest and affordable ways to gain attraction is by advertising with big and colorful signs. 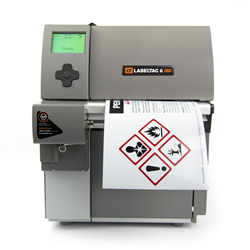 The LabelTac 6 Duo sign and label printer is now offered through Creative Safety Supply and is considered the ultimate printing system for colorful signs, labels and warnings that demand attention. The printer can print signs and labels up to 6 inches wide and banners up to 60 feet long. The large format, multicolor printer will create high-visibility signs and labels that will get any business noticed. The LabelTac 6 Duo Color Printer is an industrial grade printer but requires little or no training on how to use it. Anyone can design visuals with its easy-to-use operating system making it an ideal printer for lean, 5S, and Kaizen labeling events. It also has timesaving label creating pipe markers, GHS, arc flash, right-to-know labels, and more. High end, tough quality, professional banners can be made quickly and easily for displaying text that will get customers flowing through the doors. For more information about the LabelTac 6 Duo Color GHS Printer, please contact Creative Safety Supply at http://www.creativesafetysupply.com or call toll-free (866)777-1360 to speak with a professional and courteous representative.